Chancellor Emeritus Kenneth A. 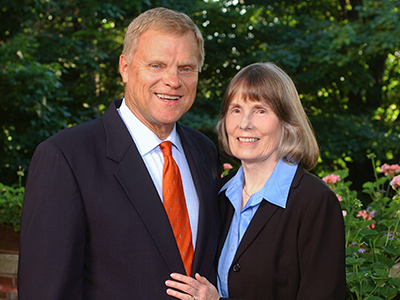 “Buzz” H’04 and Mary Ann Shaw H’04 will visit the Syracuse University campus April 19-20 for a special two-day celebration honoring their enduring impact on the University and greater community. Both will receive the Chancellor’s Medal during the One University Awards Ceremony on Friday, April 20, at 4 p.m. in Hendricks Chapel. Kenneth Shaw served as Syracuse University’s 10th Chancellor and President from 1991-2004. Mary Ann Shaw, associate of the Chancellor during her husband’s tenure, was a champion for the integration of public service and literacy and was the driving force behind the launch of the Center for Public and Community Service (now the Mary Ann Shaw Center) in 1994. Both received Syracuse University honorary degrees in 2004. Thursday, April 19, at 1:30 p.m.
Thursday, April 19, at 4 p.m.
Friday, April 20, at 4 p.m.
Friday, April 20, at 5:30 p.m.
American Sign Language (ASL) interpretation and Communication Access Realtime Translation (CART) will be provided. For questions about accessibility or to request accommodations, contact the Equal Opportunity, Inclusion and Resolution Services (EOIRS) office at 315.443.4018 or email ada@syr.edu. During his time as Chancellor, Shaw focused on transforming Syracuse University into a nationally known, student-centered research university. The Shaws built a culture of leadership on campus, and Shaw turned the University around fiscally and established it on stable financial footing. The forthcoming Syracuse Press volume “The Shaw Years” chronicles a great reinvigoration of Syracuse University—academically, fiscally, culturally and creatively—during Shaw’s tenure. Shaw is the author of “The Successful President: ‘Buzzwords’ on Leadership” (American Council on Education/Oryx Press, 1999), “The Intentional Leader” (Syracuse University Press, 2005) and “The Intentional Leader—2009 Supplement” (Syracuse University Press, 2009), in addition to more than 40 articles and book chapters on leadership and issues in higher education. In 2010, the Syracuse University Quad was dedicated as the Kenneth A. Shaw Quadrangle to honor his transformative role in making SU the institution it is today. Upon his retirement as Chancellor, Shaw served as a University Professor for six years, teaching courses on leadership on the undergraduate and graduate levels in the Whitman School of Management. In commemoration of the visit, Syracuse University Press will issue a new book, “Syracuse University: The Shaw Years,” authored by David Tobin. It is the sixth book in a series of books that chronicle the University’s history. Copies of the book will be available in the SU Bookstore beginning this week. The Shaws now reside in suburban Chicago. They are the parents of three children and have seven grandchildren.